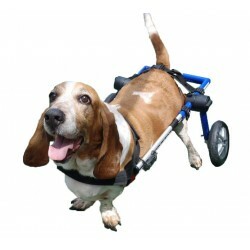 Wheelchairs for dogs return their mobility and independence when there are dysfunctions in the hind limbs. This not only improves their physical condition but also their attitude and health. It can be totally adjusted to fit any dog perfectly well. It grows with the dog, it is easy to carry and light. Mini size (for dogs less than 4 kg. ): 49,90€/month (+150€ deposit) Small size (for dogs between 4 and 11 kg. ): 64,90€/month (+200 € deposit) Large size (for dogs with more than 11 kg. ): 79,90€/month (+250 € deposit ) Urgent shipment! 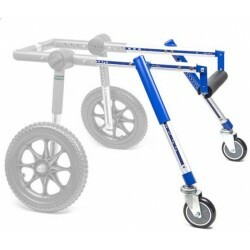 The front wheels attach easily to the wheelchair dog.This accessory is used for dogs that show weakness in the forelimbs.